We're all anxious to know which two of this week's authors will compete for Finalist. So let's get to it! Clash 5 from earlier in the week was between Karen Witemeyer's "A Tailor-Made Bride" and Lena Nelson Dooley's "Love Finds You in Golden, New Mexico." I'm a sucker for a good cover and both these books' lovely images drew me in, at once. But it isn't the cover that we vote on (although that would be a great idea for a Clash, wouldn't it?!). It's the excerpts that count, and this time around, A TAILOR-MADE BRIDE was the one that received the most votes. Lena, you were one of our first contestants here at COTT, and it's been our pleasure to have you back with us for another go-round. Thank you for hanging out with us this week! *The battle becomes increasingly fierce!! Wow! Both authors hit the emotional points with precision. Loved them both....choosing = VERY difficult!!!! God bless, and keep clashing!!! *Wow, I can't believe how tough that was. I did recognize one scene -- so I've read one of these books. Didn't make it any easier. Good job! *Hahaha! Love Excerpt A! I would certainly love to pick up this book sometime soon! For me, Clash 6 was the toughest round yet. Of the forty plus excerpts that have graced our COTT arena, only a four have impacted me so strongly that I've immediately bought the Kindle version and begun reading. These are two of those books, and they both made it to my Top Ten list. I'd love to see both go on to the finals, but alas, I must bit one farewell. Christine, it's been a blast having you on COTT again. When the sequel to Shadowed in Silk releases, come back by with another submission! That leaves THE GREEN VEIL as the WINNER. Later today, you will proceed to the next round with Karen. *Keep up the great writing. Love the great books that present earthly struggles but with Godly answers. *This was the hardest clash yet. Both excellent excerpts. *Wowza! I wanna know what the whole argument was about! *Beautiful characterizations! Intriguing scenes. Well done. Question--In the book trailer video on my home page, what is the full name of the girl Nathaniel Stearns falls in love with? Winner--Renee C. Congrats, Renee! You've won a $10 Amazon gift card from Marianne Evans, author of Hearts Crossing. Question--What is the name of the book Shellie co-wrote with Lisa Lickel? Question--Naomi is celebrating the brand new (10/15/11) release of Book 2 in the Empire in Pine series, The Red Fury. 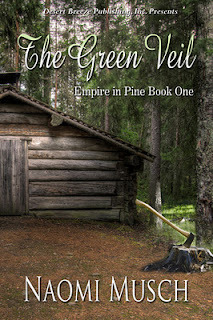 In this sequel to The Green Veil, Colette's daughter Lainey is seeking solace from tragic loss and two searing rejections by doing what 2 things? Answer--Lainey will seek adventure and break the rules to find solace. Winner--B.J. Robinson. Congrats, B.J.! You've won a $10 CBD gift card donated by, Ann Gaylia O'Barr, author of Singing in Babylon. Be on the lookout later today for the opportunity to decide which of these two winners will be our next FINALIST! Blessings to you on all your writing!